In 2018, the Coalition was approached by its Virginia members to help communicate about the benefits of the Commonwealth’s Agricultural Cost-Share Program. This program helps farmers implement best management practices (BMPs), like stream fencing, tree plantings, and well installation, on their land by helping to offset the costs of these projects. The amount of money available for these projects varies from year to year and, in some areas of the state, the demand exceeds available funds. As part of our effort to educate the public about the importance of this funding, the Coalition embarked on conducting a series of recorded interviews with farmers who have used the funding on their land. Driving through the hills of western Virginia, I couldn’t help but think back on everything that we had done to get to this point. For months, our Coalition members and the local Soil and Water Conservation District representatives had worked to find farmers who had benefited from the Commonwealth’s Agricultural Cost-Share program and were willing to talk about it to a total stranger (me) and on camera. I understand. I don’t know how much I would enjoy some random person coming to my home and recording me walking around my property while asking me questions about my work. However, once we were there it wasn’t hard to get folks talking about all of the work they had done on their land. The first visit we went on was a late addition to our shooting schedule and I am SO thankful that we were able to make it work. Not only was it the only sunny day out of the two filming days, but the farm manager, Tony Pullaro, was incredible to meet. Tony grew up on a family farm in New Garden, Virginia, but has been managing Edgemont Farm for the past 25 years. I was shocked to learn that Edgemont Farm has been around since 1796 and is home to one of the last residential buildings designed by Thomas Jefferson. The property also includes more than 500 acres of farmland. Tony has been working with the Thomas Jefferson Soil and Water Conservation District since 2003, when they installed their first stream exclusion fencing and planted their first buffer. Touring the property, you can see the difference 15 years of conservation makes. The trees are tall, strong and healthy, and Tony has noticed more fish and other aquatic life showing up in the stream. The last project was just installed in 2017, which installed more fencing to exclude all the remaining streams and, in partnership with the James River Association, planted trees in the new buffer. Luke Longanecker, Thomas Jefferson Soil and Water Conservation District and Tony Pullaro, Edgemont Farm, standing in a buffer that was started in 2017. This buffer was started in 2017 and, just 5 months before this photo was taken, trees were planted in partnership with the James River Association. Trees were already starting to take off and the grasses had already returned to the fenced off area. These will help provide shade and stability to the creek, while also helping to filter out pollution from the farm land nearby. This is what a healthy buffer looks like! This 15 year-old buffer has brought wildlife and clean water back to this local creek. These projects that Edgemont Farm has installed on their property not only help keep the waterways clean, but also keep the cattle they raise healthier! In total, Edgemont Farm has received $63,531.92 from the Virginia Agricultural Cost-Share Program, which has enabled them to install roughly 16,000 feet of stream exclusion fencing and created 40 acres of buffer. They also installed nine water troughs in conjunction with the stream fencing to create a 10 paddock rotational grazing system. There are approximately 46,000 farms covering 8.2 million acres (32 percent) of Virginia. Agriculture is also the largest source of nutrient and sediment pollution reaching local streams and the Chesapeake Bay. While many well-operated farms employ sound conservation practices that protect water quality, a lack of funding and technical resources prevent many farmers from implementing such practices. The Virginia Agricultural Cost-Share (VACS) Program is designed to offset the costs of implementing best management practices (BMPs), like installing stream fencing and planting forest buffers, on farmland around the state. In October 2018, the Coalition interviewed three farmers who have utilized the program and have seen both the financial and environmental benefits first hand. While this program is essential to cleaning up our local rivers and streams, the amount of money available for these projects varies from year to year and, in some areas of the state, the demand exceeds available funds. The Coalition and its members in Virginia support funding the Virginia Agricultural Cost-Share Program at the documented need of at least $100 million per year according to the Agricultural Needs Assessment and upholding consistent and adequate annual funding to ensure certainty. For more information on this program, please visit the Virginia Conservation Network. Yup. Farmers care, just as much as we do. I had the wonderful opportunity to attend the Chesapeake Watershed Forum that was held at the National Conservation Training Center in West Virginia. The conference was created to connect the environmental community and discuss, simply, how to better take care of the Chesapeake Bay and our local waterways. A local nonprofit and Choose Clean Water member, Alliance for the Chesapeake Bay, hosted the event and man, did it live up to all my expectations. As a student majoring in Journalism and New Media with a deep-rooted passion for conservation and the environment, this weekend opened my eyes to just how pervasive the conversation around restoration is throughout the community; specifically, on agriculture. 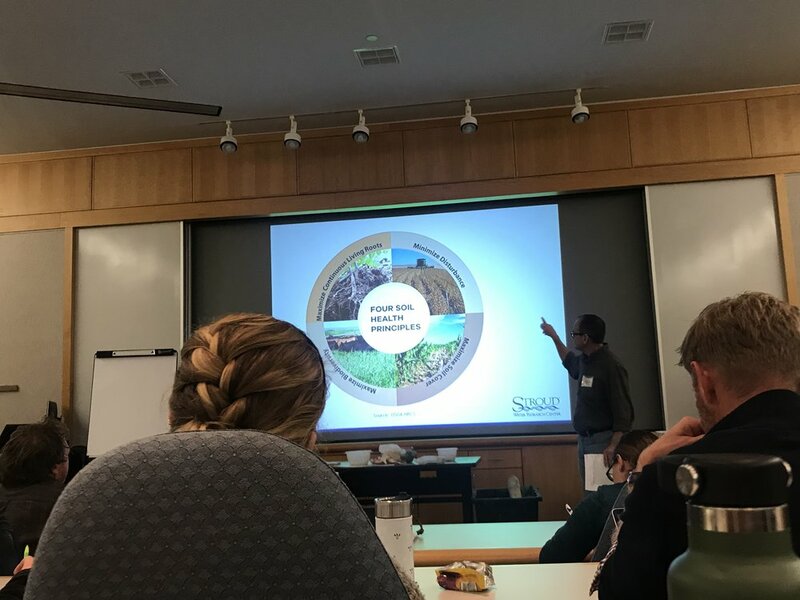 I sat in on many sessions, from Implicit Bias and Gender in Conservation to Self Care in Trying Times, but nothing stuck out to me more than the workshop session titled, "Advancing Soil Health for Productive Agriculture and Clean Water," and let me tell you, it was nothing short of informative and entertaining. For one, I learned the four, simple and essential principles to healthy soil. Minimize Disturbances - No tilling! Maximize Soil Cover - Cover crops. Keep the soil covered as much as possible. Maximize biodiversity - Use crop rotation and a diverse mixture of seeds. Maximize continuous living roots - Keep the plants growing (carbon) for the microbial network. The most important speaker was Leroy Bupp — a long-time experienced farmer, who advocates throughout his hometown in Pennsylvania for environmentally-friendly farming methods, like no till, reducing fertilizer, and cover crops. “I've been a farmer for 50 plus years, but have been a conservationist all my life," Leroy said. As someone who is just learning about how different industries impact our waterways, it was interesting to hear from farmers about how they can positively impact sustainability and are environmentally conscious. I'm a visual learner. So what I appreciated most, was the fact that he debunked the belief that tillage "loosens up the soil," by showing us a visual demonstration featuring 2 tennis balls: One covered in soil from his farm that has not been tilled since 1971, and another ball covered with dirt from his neighbor's farm that still uses tillage (I use the word dirt and soil loosely, because they are not interchangeable). Here are the results. The picture speaks for itself. ﻿I'll break it down for you as non-sciency as I can (I'm a mass communications major, so I can understand the struggle to grasp certain scientific concepts). Tilled soil turns into unhealthy dirt. The clay particles become separated, it oxidizes and compacts itself. When this happens, the dirt will not allow water to percolate through it. Imagine water from the left jar after a rainstorm flowing from a farm that still uses traditional tilling methods. You getting what I'm throwing? Tillage wreaks havoc among underground habitats, too. Tillage kills over 50% of night crawler worms, 80% of cocoon eggs and 100% of worm and root channels that are needed to absorb water. These critters have a biological responsibility, too. They are part of a healthy soil system. Non-tilled soil, as shown above, percolates right on through the pores of healthy soil. Thus, the result is translucent water. Let me also note that the jar on the right of the picture is an actual sample from the 13 inches of rain that had dumped onto Leroy's farm from July. He is a walking testimony to how the lack of tillage is the road to clean water. How are Leroy and other farmers working to reduce agricultural runoff and promote soil health? Cover crops - these are plants that are planted after crops have been harvested. They protect the soil for future cash crops, suppress weeds, reduce insect pests and diseases, absorb excess fertilizer, feed the microbes in the soil, enrich the soil with organic matter (we have lost over the last 100 years about 1/2 of our organic matter), improves infiltration and provides a habitat for beneficial insects. Healthy soil systems mean being able to lay off the fertilizer that the pollute water. Forrest buffers - grasses, trees, plants and shrubs that are planted along the ridges of farm fields and along waterways that help reduce the amount of pollutants flowing from land into rivers and streams. They absorb the polluted runoff and provide habitat for wildlife. Streamline fencing - keeps the cows, E. coli and chicken waste out of the water. Unfortunately, these projects can be very expensive, and are hard to start without securing funding from a state or federal fund. Many farmers want to do the right thing for the environment, but do not possess the tools to make it happen. While some are just stuck in their ways. 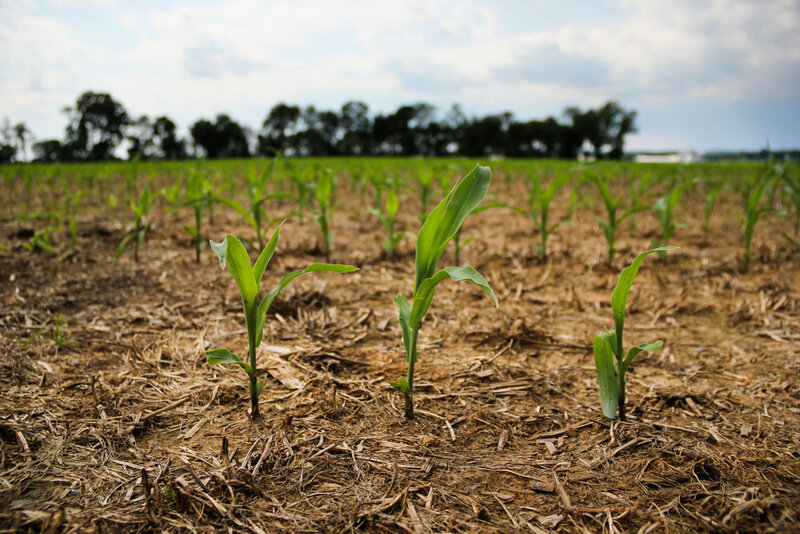 This is why it is imperative that programs be created to help provide funds for farmers to begin these best management practices (BMPs) and for continued maintenance. I know you're thinking, "Taylor, who cares about farming? How does it in any shape or form affect me?" Well, I thought you'd never ask. Did you know that agriculture is the single largest source of nutrient and sediment pollution entering our streams and rivers? Nutrients like nitrogen, phosphorous and sediment are a big and scary no-no when it comes to water quality. When we have huge rain storms, sort of like the record breaking ones we just had over the Summer, the rain carries with it fertilizer, manure and herbicides, from farms and garbage from urban development into our local waterways. This is detrimental to aquatic life, our drinking water and causes soil erosion (healthy, stable soil means yummy food for us). The excess of nutrients, such as nitrogen and phosphorus, that enter these waterways power the growth of nasty algae blooms that block sunlight from reaching underwater grasses. It then robs the water of oxygen that plants and animals are dependent on to survive. So you see, the soil affects our water, which also affects human health. With all that being said — It’s just nice knowing that we have progressive and innovative farmers who care about land and water conservation as well as keeping our bellies full. We must understand the importance of protecting what nature takes so long to create. I hope that this information and concern for our planet will pass down with each farming generation to come. When you drive past a farm, brightly colored green, with those noticeable BMPs, give them mental props for their commitment to healthy farm practices and clean water. Did you know, Lancaster, Pennsylvania is home to more than 5,000 farms – bringing in about $1.5 billion annually? The area boasts naturally rich soils and the perfect climate for productive dairy farming. The average dairy farm in Lancaster holds 65 cows and uses one billion gallons of water each year. That is a lot of water, and considering there are 1,700 dairy farms in Lancaster it is important that Pennsylvania finds a way to balance its farming tradition with modern ecological practices. The nutrient and sediment pollution from agriculture can upset watersheds, but Lancaster is becoming a leader on reducing agricultural pollution, and is bringing together different stakeholders to combat this issue. We are so thrilled to be able to organize this year’s conference in Lancaster. As a coalition dedicated to protecting and rallying for clean water, it is a great opportunity to reach an area that could benefit from our presence – and similarly, we will absolutely benefit from hearing what locals have to say! All of our conference sessions and field trips include a bit of Lancaster, and even the drinks and food provided are from locally based companies who understand that healthy water starts with hardworking communities who care. Our agricultural sessions include “Restoring our Waterways with Healthy Soils”, a discussion led by prominent thinkers from multiple organizations in the Chesapeake area. Another key agricultural session is the “Turning Rooftop Runoff into Food”, which focuses on community gardens and the ways we can benefit economically and environmentally from them – specifically in Frederick, Maryland where the community is growing fresh vegetables for under-served residents. Not only are some sessions farm-related, but we could not have a conference in Lancaster without at least one farm tour! The “Good Food, Healthy Farms, & Clean Water” field trip gives attendees a chance to tour local farms and co-ops, while the “Plainsect Dairy Farm Tour” focuses on exploring agricultural BMPs on a local dairy farm, as well as understanding the values of communities to build strong connections with them. The Chesapeake watershed is home to many farms; 87,000 to be exact. Farmers have been a force for Bay restoration for a long time, employing a litany of different sustainable farming practices to protect clean water in local streams and rivers. 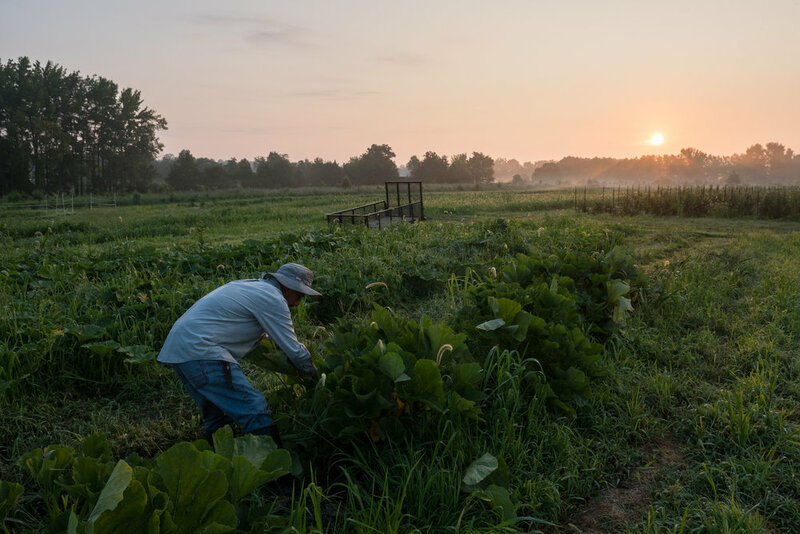 A new report by the Chesapeake Bay Commission finds that these practices are serving the watershed well, however farmers will require much more outside help to get the Bay to meet its 2025 cleanup goals. Farmers rely on a variety of programs—both public and private—to identify their farm-specific environmental threats and the methods they can implement to practice environmentally-sound farming. These programs provide farmers with experts that can discuss policy, financial assistance, program compliance, practice verification and much more. The CBC even went as far as to say, "Reliance on accessible, high quality technical assistance professionals is an essential component of successful modern-day, environmentally-sound farming." An assessment by the Chesapeake Bay Funders Network found that there is not currently enough technical assistance available in Maryland, Pennsylvania or Virginia to meet farmers’ needs. This shortage exists in all six of the Chesapeake Bay watershed states, which can pose a threat to the 2025 clean-up goals launched in 2010 by the EPA. Specifically, the participants in the CBFN assessment estimated that the number of on-the-ground technical service professionals needs to increase by 30 percent to meet current demand. Technical services that would be offered to farmers may include, for example: educating a farmer about available pollution reduction ‘cost-share’ programs; advising a farmer on ‘whole-farm’ conservation planning; or sharing engineering expertise on the implementation of farm-specific pollution reduction practices. Without proper access to these services, farmers won't be able to access the needed help to implement pollution reduction measures. This threatens the Bay states' ability to meet their targets for reducing farm-generated pollution. These measures are not one-size-fits-all, and will vary based on the farm. The report isn't pessimistic, however, as the CBC put forth several ideas for ways that Bay states can meet its goals. The CBC feels that farmers could have more access to necessary help by making training and certification of technical experts more streamlined and accessible, and that private sector providers should be given full certification authority (e.g. the ability to certify plans, the implementation and verification of practices, etc.). Similar how there needs to be an effort to harbor a more positive environment with private sector and non-profit experts, there needs to be a more favorable relationship for publicly employed conservation professionals. The CBC recommends that a tuition loan assistance program be available for conservation officials who provide technical assistance to farmers. They also suggest that a two-year technical assistance certification program for high school graduates that includes a post-graduate apprenticeship program be developed. As to be expected, increased funding on a state and federal grant level would greatly increase farmers' ability to employ pollution reduction measures. This report was peppered with success stories from various farmers about their positive experiences working with experts, which is an encouraging sign that these efforts are a step in the right direction. Bay conservation relies on action and unity on all fronts, but agriculture especially needs resources and funding to reduce pollution to meet the Bay states' 2025 goals. Agnes, Hugo, Floyd, Andrew, Katrina, and Sandy turned out to be dastardly souls. This year, we also had the misfortune of meeting those vile beings called Harvey, Irma, and Maria. These infamous characters are none other than the hurricanes that have had damaging impacts on the landscape of the United States in recent years. As global temperatures increase, scientists have been warning that hurricanes will occur more often and be more intense. In May 2017, NOAA predicted an above-average hurricane season with anywhere between two and four major hurricanes (categories 3-5). NOAA updated this prediction in August 2017, suggesting that as many as five major hurricanes could impact the United States.The storms that make landfall are more intense due to rising global temperatures. Warm air can hold more water vapor, therefore allowing storms to hold and drop more precipitation when they make landfall. The 2017 hurricane season may go down in history for the unparalleled destruction caused by the frequent and intense storms. Hurricane Irma destroyed 25% of the homes in the Florida Keys and resulted in 65% of the homes having major damage. Hurricane Maria was the strongest storm to ever hit Puerto Rico. The damage from Maria decimated the energy grid and it will likely take months to restore power to the island. Hurricane Harvey, however, claims the precipitation title. The storm set the record for the most rainfall ever from a tropical cyclone in the continental United States, dropping 51 inches of rain. 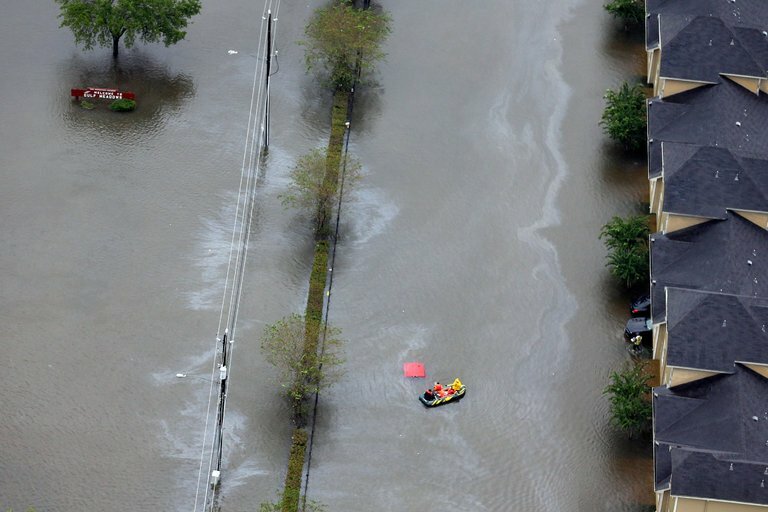 It is estimated that the storm dumped 27 trillion gallons of rain over Texas and Louisiana. While the Bay region has been relatively untouched by severe weather this hurricane season, we should be mindful that severe weather events could derail improvements made to the Bay. Hurricane season overlaps at least partially with the crop harvest season. Croplands are more susceptible to erosion when the crops have been harvested and the land is barren. Additionally, strong winds and flooding events virtually eliminate the benefit of soil capturing best management practices like vegetated buffers. Strong storms also have the power to churn up and flush out legacy sediment that has been holding nutrients in place for centuries. This photo (courtesy of Google) depicts the sediment clouds in the Susquehanna River leading into the Chesapeake Bay following Tropical Storm Lee. The effects on the Chesapeake Bay of Tropical Storm Lee, which is by comparison a much smaller storm than either Irma, Maria, or Harvey, are well documented and informative. In September 2011, Tropical Storm Lee generated between 4 and 7 inches of rain throughout much of the Susquehanna River Basin, with some areas getting over 12 inches of rainfall and many areas experiencing flooding. The release of sediment, and therefore nutrients, from the Susquehanna River past the Conowingo Dam produced a 100-mile plume that was visible by satellite for several days. It was widely acknowledged that the nutrient releases to the Bay from this event were significant. Multiple storms making landfall over the Chesapeake Bay in the same hurricane season could have compounded impacts. We can look to the events in the Pamlico Sound of North Carolina in 1999 as illustrative. That year, three hurricanes hit the area and dumped approximately 1 meter of rainfall, which created 50-500 year flooding events. It was estimated that the combined floodwaters from these three storms decreased salinity in the estuary by 75% and delivered at least half of the annual nitrogen load. Other effects from these three storms on the estuary were: a creation of conditions within the water body that are not conducive for aquatic life, an increase in algae which exacerbates the poor conditions for aquatic life, the displacement of marine organisms, and an increase in diseases in fish. With two months remaining in hurricane season, the Bay Watershed is still at risk of experiencing a major storm event. Unanticipated releases of nutrients and sediment to the Bay could throw a monkey wrench in the progress that has been made to date. With Nate lurking around in the Caribbean and models suggesting a path over the Bay Watershed, threats posed to the Bay’s improvement by severe weather should not be discounted or ignored. The Caseys and the Smuckers– two Pennsylvania families with a rich history in different lines of work, but with a lot of the same interests: family, faith, farming and clean water. I was lucky enough to be part of a great day where two scions of these well-known families spent a few hours together looking at conservation problems and solutions on an Amish farm in Lancaster County, PA. Senator Bob Casey (D-PA) is the senior Senator from Pennsylvania and a member of the Senate Committee on Agriculture. His father was governor of Pennsylvania. Joe Smucker has taken over his family’s dairy farm outside of East Earl; the farm has been in his family for generations. Jenn Quinn (PennFuture) and I laid the groundwork for the tour earlier in the year when we were visiting Pennsylvania Congressional offices on Capitol Hill. In our meeting with Senator Casey’s Senior Policy Advisor we first thanked the Senator for his past support for full funding for the Chesapeake Stewardship Grants. Then, we pitched the idea of getting the Senator out to look at some projects that were already funded. That offer, after some lengthy negotiating and a few date changes, is what led to this tour on a perfect summer day in early August. The conservation practices on the Smucker Farm came from many sources – funding and/or technical assistance from an array of agencies and organizations, as well as the vision of Joe Smucker and his family. We focused on a Chesapeake Stewardship Grant that had been given to the Stroud Water Research Center, which in turn worked with a number of farms and farmers in the region. We had folks from Stroud, TeamAg, Lancaster County Conservation District and PennFuture join with those of us who organized the tour. The National Fish & Wildlife Foundation (NFWF), who administers the grant programs, hosted the tour. We were joined by Russ Redding , Secretary of Agriculture for Pennsylvania, as well as a number of neighboring Amish farmers who wanted to see what was going on at the Smucker Farm. We were also joined by a reporter with the Lancaster Farming newspaper. Click here for his take on the day. We were met by the entire Smucker Family – Joe, his wife Martha, most of their kids (some were still working in the field), Joe’s father (Joe Smucker, Senior) and their neighbors. Senator Casey arrived and spent time chatting with the Smuckers, including their children, and all the neighbors. Joe Smucker led the tour and showed us a new manure stacking area. He told a story about the large open manure pile that served as the farm’s “storage” area right next to where we were standing. He noted that every time he walked by the pile it bothered him because he knew that when it rained the manure washed down the hill into the creek in the valley on the farm. As soon as he was able to get assistance from the United States Department of Agriculture (USDA), he fixed this problem. We also looked at a forested riparian buffer that was recently planted along the small creek (headwaters of the Conestoga) in the farm’s valley. We learned about the Smucker Farm use of no-till farming techniques and cover crops, and their conservation plan. All of these conservation practices depended on financial and technical assistance from an array of sources, including Stroud and NFWF. Joe Smucker was asked if he would be going around talking to other Amish farmers and encouraging them to install many of the conservation practices that he had. He gave a calm, reasoned and eloquent response – that started with “No”, but that he was willing to “lead by example” and would be happy to show what he did and talk to anyone who contacted him about it. Senator Casey was very interested in many of the aspects of the conservation practices that were being used on the Smucker Farm, including how to get more of those practices onto other farms in Pennsylvania. Senator Casey also interacted with the Smucker children, including their young daughter, where he related a story about being the father of four daughters. At the end of the day Secretary Redding and I had a few minutes to discuss a proposal by Governor Wolf(D-PA), where he was seeking $10 million from USDA for conservation in the Chesapeake Bay watershed portion of the state. We urged Senator Casey to weigh in with the Obama Administration in support of this proposal. Shortly after this tour, Senator Casey sent a very strong letter to the heads of the Office of Management and Budget and the Council on Environmental Quality, both in the White House, urging the Administration to provide additional support for conservation practices on farms in the Chesapeake Bay portion of PA. We’re hoping to learn the fate of this proposal by October 4, when the Chesapeake Executive Council (Bay watershed governors, EPA Administrator, DC Mayor and Bay Commission chair) has its last annual meeting during the Obama Administration.